You are here: Home / Jewelry / Buccellati turquoise and diamond ring. Buccellati turquoise and diamond ring. I just love turquoise in gold – the color contrast is wonderful. This bombé cocktail ring centers a large and lovely oval-shaped cabochon turquoise. From the picture, it looks to be marvelous robin’s egg blue. 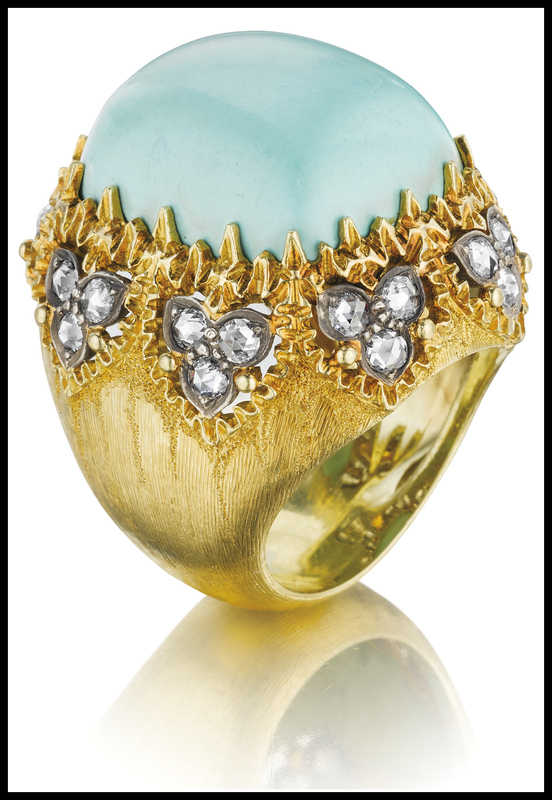 The turquoise is mounted in 18k textured yellow gold and accented by a surround of rose-cut diamond trios. The piece is signed ‘M.Buccellati’. 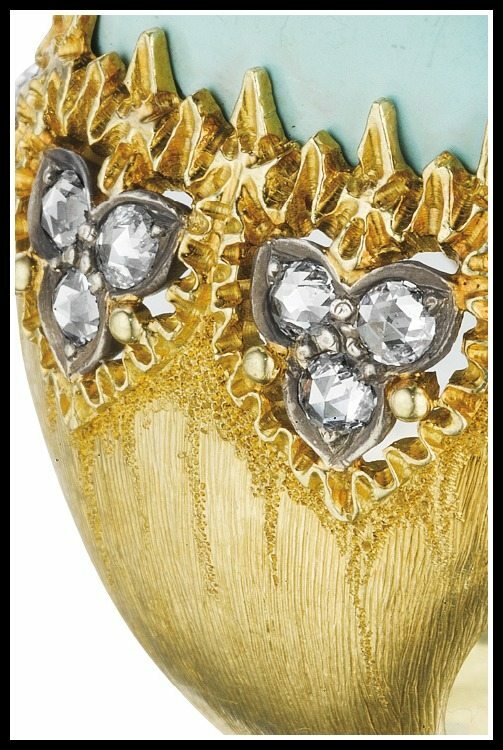 If you’re familliar with Buccellati, you won’t be surprised by the intricate detail work in the gold that surrounds that juicy hunk of turquoise. I actually think we need to zoom in and get a closer look at the details. Isn’t it magnificent? Texture city. And so detailed: see the tiny peaks where the gold meets the turquoise, like the cabochon splashed into the mounting or the gold is holding on to the stone? This is so much more than just a big ring. It also happens to be a 5 1/2, which makes it a perfect right-hand ring for me. What do you think of it? Would you prefer something smaller, or are you dying to get this on your finger? This Buccellati turquoise and diamond ring was listed in a December 2013 auction at Phillips. All images and info are thanks to Phillips.